Kia rolls out its third-generation Forte. Now in its third generation, the 2019 Kia Forte has its sportiest look yet. Compact cars and all car models, in general, have seen an unprecedented drop in sales over the past decade. Consumers have voted with their wallets, opting for more utility vehicles and pickup trucks instead. Some manufacturers, such as Ford and Fiat Chrysler, are cutting back on car models, abandoning some segments altogether. Kia, however, isn’t turning its back on value-oriented consumers, especially first-time new car shoppers who can’t quite afford an SUV, but might yet afford a small car. Notably, Kia’s product line is far more balanced than some other brands, with six sedans and two hatchbacks to consider. You’ll also find a line of people movers, including utility vehicles and a minivan. Furthermore, Kia is represented by five electrified vehicles — two hybrids, two plug-in hybrids, and one electric vehicle. Moving forward, you’ll see more crossovers join Kia’s model line, but likely at no expense to car models. The third-generation Kia Forte rolls out for the 2019 model year. What’s especially noteworthy about it, is that this is only the 10th model year for Kia’s small sedan. Thus, while many competitors update their cars once every six years, Kia does so in either four or five years. That’s a great way to keep a model name fresh. It also ensures that Kia keeps up with or outlasts the competition. The 2019 Kia Forte is sold in sedan, five-door hatchback (Forte5) and two-door (Forte Koup) configurations. Our review covers the sedan only, but if you need ample utility, then take a closer look at the hatchback. As for the coupe, consider this body style if you insist on sportiness. Kia offers four Forte sedan trims, beginning with the FE ($17,690). Dealers won’t stock many of those, so take a look at the three other trims: LXS ($19,090), S ($20,190) and the EX ($21,990). Add $895 for the destination charge. All this represents a very tight price separation between the four trims. It is even tighter for FE customers who upgrade from the manual transmission to the CVT, adding $900 to their price. The CVT is standard elsewhere. The two base trims come as delivered — there are no packages available. Choose the S trim and you’ll find an S Premium Package ($1,200, with LED headlights with automatic leveling, high beam assist, a power sunroof, and LED interior lighting). Choose the top EX trim and you’ll find an EX Launch Edition Package ($3,210). This package includes all the features of the S Premium Package and adds such amenities as a rear trunk lid spoiler, 17-inch graphite finish alloy wheels, smart cruise control, parking distance warning-reverse, improved telematics, a wireless phone charger, and an 8-speaker Harman Kardon audio system. My test EX model came fully equipped, pushing this model’s final price to about $26,000. The 2019 Forte sedan’s design is the sportiest one yet, inspired by the Kia Stinger. The Stinger is Kia’s special performance sedan (actually, it is a hatchback), which sits on a rear-wheel-drive platform with available all-wheel drive. The Stinger competes with the Dodge Charger and Chrysler 300, as well as with select European models. Design elements from the Stinger have found their way to the Forte. Indeed, the Forte’s silhouette is the antithesis of a boxy design, with its falling hood, a long roofline, high beltline, and tapered rear deck. The Forte’s front fascia features the latest interpretation of Kia’s tiger-nose grille, delivering a look that is at once sophisticated and handsome. Lighting details, profile creases, and available diffuser-like trim add visual interest. Kia’s designers worked diligently to impart a more refined look to the Forte and it pays off. Standard exterior features include projector low-beam (and automatic) headlights, 15-inch steel wheels, and power-adjusted side mirrors. Among the many available upgrades are LED lights, front fog lights, alloy wheels, heated side mirrors, puddle lamps, a power sunroof, and a rear spoiler. Inside, the cabin is roomy, offering space for five passengers. The dashboard is fairly simple, yet it offers its own panache, with layers and lines embellishing the surface. The instrument panel is uncomplicated with two analog dials dominating. The center stack is topped by a wide and colorful screen. The ledge at the bottom of the screen is where you may rest your cell phone. In some models, it doubles as a wireless charging port. This is a handy feature and certainly beats storing your cell phone in a cup-holder. Other standout cabin features include minimal buttons and switches to control everything, large in-door storage areas, and an oversized glove box. 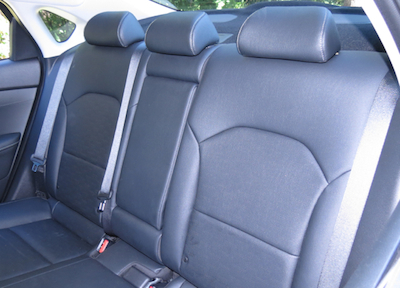 As for seating, the front seats are comfortable and offer decent support. 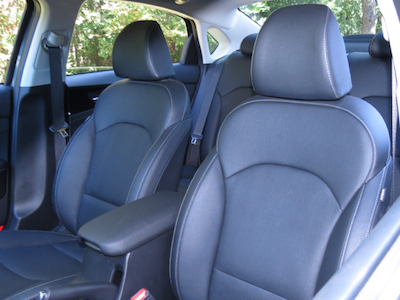 The rear seat holds up to three, although legroom may feel tight for tall passengers. This 60/40 bench seat folds down and provides access to the roomy trunk, measuring a generous 15.3 cubic feet. Standard interior features include full power accessories, a tilt-and-telescopic steering column, and dual-zone automatic climate control. The list of optional features include a power driver’s seat with lumbar support, heated and ventilated front seats, imitation leather seats, a sliding armrest, an illuminated glove box, and LED lighting. All 2019 Fortes come with an 8-inch touch-screen audio system display. The list of standard features includes Apple CarPlay and Android Auto smartphone integration, USB and auxiliary audio input, and Bluetooth connectivity. The two bottom trims have a four-speaker audio system, while the two top trims are equipped with six speakers. Available features include satellite radio, HD Radio, navigation, an additional USB charger, and wireless charging. An eight-speaker Harman Kardon audio system is also available. Among standard safety features, you’ll find forward collision avoidance, lane departure warning, and lane keeping assist. Depending on the trim, you’ll find additional safety features, including lane change assist, blind-spot collision warning, rear cross-traffic alert, high-beam assist, parking assistance, and smart cruise control. Kudos to Kia for bringing sophisticated safety technologies to a mainstream compact model. “Budget” no longer means stripped and your personal safety doesn’t require you to opt for a pricey model. All 2019 Fortes come with a 2.0-liter four-cylinder engine paired with a continuously variable transmission. What’s interesting here is that the CVT is new to the model line and unique to Kia (corporate cousin Hyundai utilizes a six-speed automatic transmission). The Kia powertrain delivers 147 horsepower and 132 pound-feet of torque and, thus, is geared toward efficiency, not performance. Indeed, in its most efficient form, this model makes a laudable 31 mpg in the city and 41 mpg on the highway. Kia took special care to develop a transmission that behaves more like an automatic than a CVT. 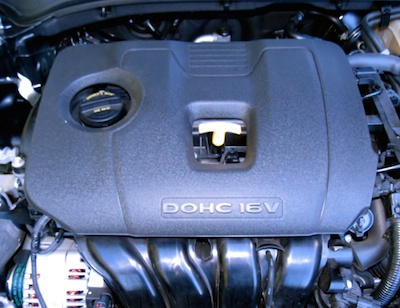 A CVT represents a gearless design, which means the engine usually revs loud under hard acceleration. But Kia’s engineer’s worked with software developers to mimic steps, which mitigates noise and the uncomfortable “it sounds like the engine is going to blow” feeling that goes with it. The front-wheel-drive Forte is not performance-oriented by any stretch, although it navigates corners with ease and supplies a reasonably comfortable ride. What may disappoint some is that the previously available turbo option is gone — you’ll still find this engine in the top trims of the hatchback and coupe. Kia gets nearly everything right with the 2019 Forte sedan. But even the lack of a more powerful engine option seems somewhat inconsequential here. 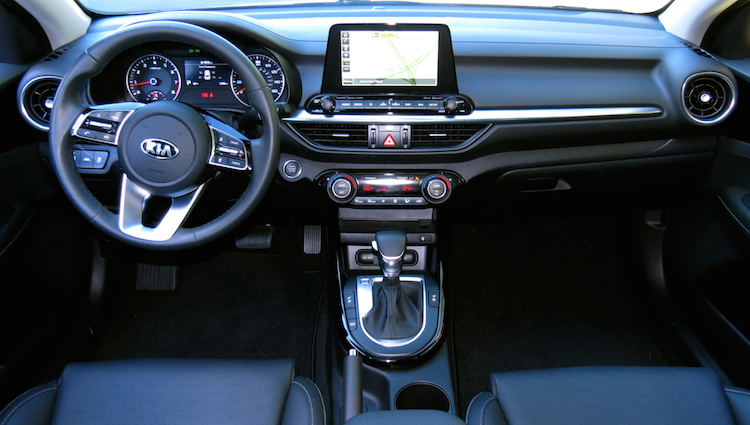 After all, Kia delivers a sporty design with a modern and roomy interior and ample trunk space at the ready. This automaker also supplies advanced safety technologies and delivers its share of in-cabin amenities and options. These features make the Forte an impressive entrant in a competitive segment. Among the Forte’s chief competitors are the Toyota Corolla, Honda Civic and the Nissan Sentra. The Hyundai Elantra, Volkswagen Jetta, Chevrolet Cruze, and Mazda3 also warrant a look. Other models include the Subaru Impreza (with standard all-wheel drive) and the outgoing Ford Focus. 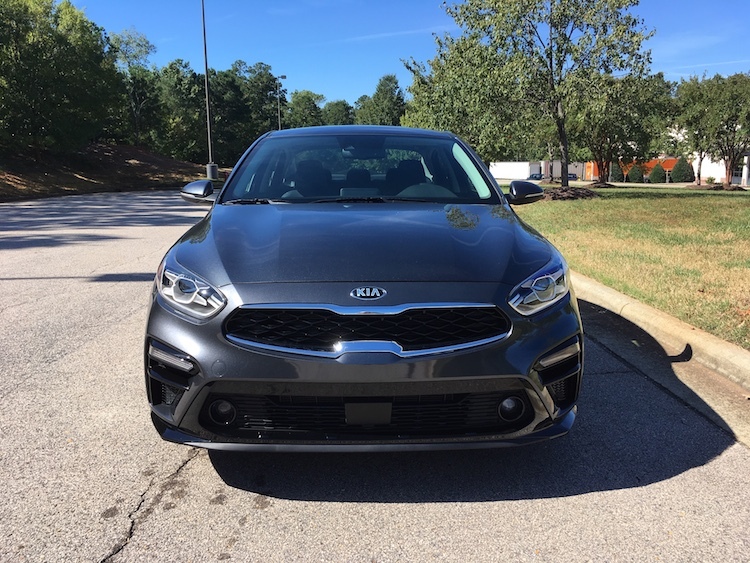 Lastly, keep in mind that Kia offers an outstanding warranty plan, which delivers longer bumper-to-bumper protection, an extended rust warranty, and a noteworthy powertrain plan. Altogether, Kia is big on value and strong on amenities, representing strong attributes consumers should not ignore. 2019 Kia Forte photos copyright Auto Trends Magazine. All rights reserved. 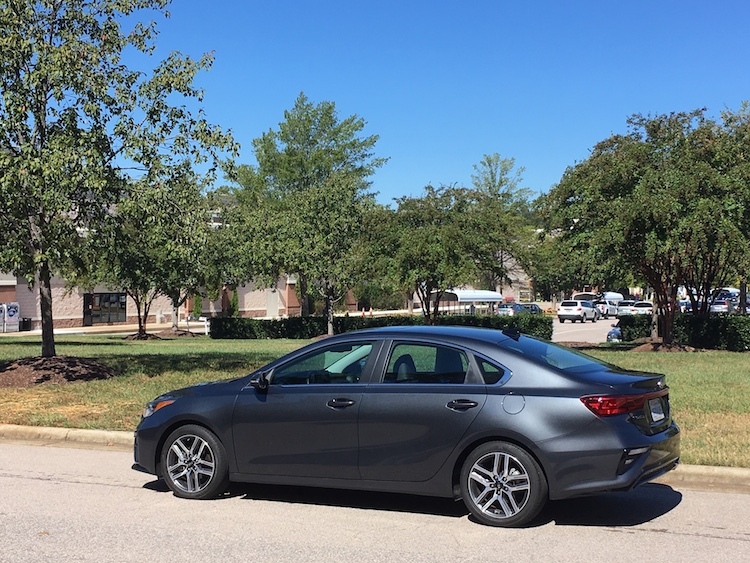 Kia’s Forte compact sedan is big on style. Son of a Stinger! 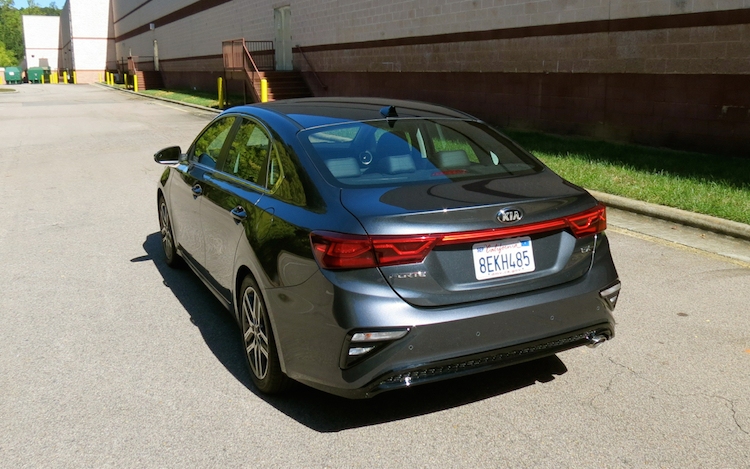 At first glance, the 2019 Kia Forte looks a lot like the premium Kia Stinger performance sedan. Those ported design elements provide the Forte with perhaps the most handsome sheet metal amongst small cars, something certain to capture the attention of car shoppers. Kia used the occasion of the 2018 North American International Auto Show in Detroit to debut the Forte sedan, now entering its third generation. As before, three trims are for the choosing: LX, S and EX. Pricing details will come later this year — likely closer to when the model goes on sale. In the interim, we should learn more about the Forte5 hatchback. With a base price coming in at $32,800, the 2018 Stinger is beyond the reach of many mainstream car shoppers. The Stinger’s price, however, is very reasonable when stacking it against luxury models such as the BMW 3 Series or Cadillac ATS. But we’re talking about the 2019 Forte, a sedan that will cost half as much, while taking on such segment stalwarts as the Toyota Corolla, Honda Civic and Nissan Sentra. So, what you have here is a budget sedan with a premium look. My, look how far we come from the econoboxes prevalent in the 1980s, 1990s and 2000s! Today’s compact sedans rival the size of midsize models from about 15 years ago. 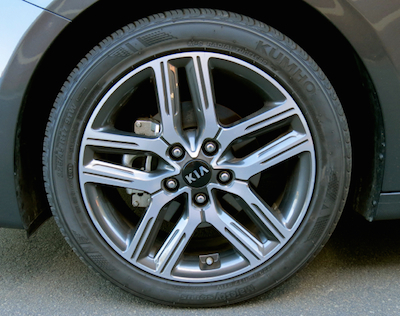 All manufacturers, Kia included, have adopted longer platforms, while delivering more powerful and efficient models. Engineering changes and the expanded use of lightweight materials are behind the effort. Consumers are the winners because they get more car for the money. We don’t have full information yet about the powertrains available with the 2019 Forte. What we do know is the base model comes with a 2.0-liter four-cylinder engine, generating 147 horsepower and 132 pound-feet of torque. We also know the very first continuously variable automatic transmission offered by Kia sends power to the front wheels. This is an important move for the automaker as a CVT is more efficient than a cog-driven unit and should raise fuel economy by about 3 mpg to 35 mpg according to a Kia estimate. Compact mainstream models include technologies luxury manufacturers were just beginning to offer five years ago. 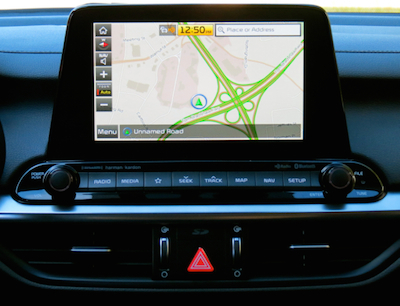 Besides that, some of the tech features such as smartphone connectivity via Apple CarPlay and Android Auto are free. You can’t say that about BMW, which charges $300 for CarPlay. The 2019 Forte also presents an 8-inch color touchscreen and that’s quite a bit larger than what you’d find in this class, especially for standard equipment. An available wireless charging tray is compatible with Android devices and for Apple iPhones from the 8 Series on up. We’ve been seeing so-called driver assist technologies move down from more expensive models to mainstream vehicles and that’s always a good thing. The 2019 Forte delivers standard blind-spot collision warning and smart cruise control. Available features include forward collision-avoidance assist and smart cruise control, the latter useful for maintaining proper and safe distances between vehicles no matter the speed. From a journalist’s perspective, Kia has certainly impressed me with what it has done these past five to 10 years to its product line. Although tied in with Hyundai as part of the Hyundai Kia Automotive Group, Kia has its own take on the platforms it shares with some models unique to itself, including the Sedona minivan and Soul multi-purpose vehicle. Photos copyright Kia Motors. All rights reserved.